At this second seminar in the Blueprint for Contact workshop series, Bashar devotes his discussion to integrating the Self in preparation for ET contact. Using graphics that Bashar downloaded to Darryl, , Bashar explores the nature of the different locations on a space ship. Through a series of exercises, he helps each participant reflect on which locations they are drawn to and see how to utilize that information in understanding the Self. A first GUIDED MEDITATION takes you on board a space ship to retrieve a special gift of Self! Bashar also plays a game with us by having us decipher a series of symbols. A final GUIDED MEDITATION takes you on an exciting journey to the "Twilight Zone"-- a parallel reality that serves as a template for our physical experience on Earth. Q&A: Establishing a protocol for ET contact. Interacting with other species as a preparation for contact. How to transcend having arachniphobia The relationship between environmental degradation and imminent ET contact. Receiving guidance from your personal guides. Dealing with dementia in a relative. Panspermia--how life forms are spread throughout our galaxies. A hidden galactic function that trees provide. The purpose of experiencing separation and forgetting our connection with the whole while on Earth. Why getting in touch with love for All That Is transforms your life. The value of trusting your imagination. Feeling fear but still moving forward. Our fears of losing control in relationship to ET contact. Detoxifying the body as a means of accelerating ET contact. Living by the 13 month ca lender. How to prepare children for contact. Trusting the unique timing of ET contact. Allowing the connection to another dimension to be felt tangibly in this one. Relationships with historical figures through an understanding of parallel lives. The connection between schizophrenia, manic-depression and alien contact. How to increase your ability to go into other dimensions. Asking for contact with other dimensions before falling asleep. The comet Tongaska. The origin of Ayer vedic knowledge and downloading the knowledge from other dimensions. Genetic percentages of hybrid children. The relationship between alien abduction and Pleiadians. How emotions can be genetically engineered out of a species. Expanding your connection with other levels through acting. The Metatron entity expressed through geometric forms, ratios and golden proportion relationships. The history of Mars including human habitation, current existence of life, space missions and the reincarnational relationship with Earth. Sleep paralysis and ET contact. Expanding our understanding of our profound relationship with trees. The four universal laws and why they are unchangeable. Feeling unconscious and struggling to awaken. How to understand the physical sensations you experience during meditation. Using intention and imagination to crystallize a dream into solid manifestation. 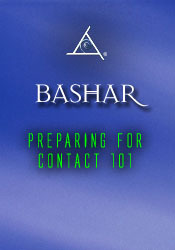 Using the diagrams Bashar provided to expand your holographic perception. Listening for the voice of God at the deepest core of your being and how it feels to connect. Bashar's enjoyment of interaction with the audience. Opening to the energies of Pleiades and Sirius. Allowing your highest excitement to be the guide for your daily activities. Demonstration of "holding on" through breathing exercises.